Looking for a review of Store Coach? Well, you have come to the right place. Store Coach have been providing eCommerce training and website brokering service for over a decade and are one of the few companies I highly recommend. A lot has changed since I first wrote this review, for one they have completely revamped their training program and added some new services. Store Coach is the product of three brothers Dave, Mike and Kevin Hermansen. They have over 15 years of experience in the world of eCommerce and have successfully built and sold many online stores. They provide comprehensive training on how to start an eCommerce business through dropshipping. They also provide a website brokering service where they have helped clients sell their websites for 6&7 figures. An additional service they added recently is a partner program in which they will build you a dropshipping business from scratch and take a percentage of the overall profits. Although I am focused more on affiliate marketing as my primary online business, I still hope to start an eCommerce store and most probably I will start it with the help of the training from Store Coach. If I had come across the dropshipping model before I started affiliate marketing, maybe I would have taken my online business along this route. With dropshipping you do not have to worry about keeping inventory or delivery of the goods. This is why it has become so popular in recent years. So, what is dropshipping? The business model is pretty simple. You keep the difference between what the customer paid and what you paid your supplier. Below is a better visual representation on how dropshipping works. Of course, you would need to do some market research and come to an agreement with your chosen supplier and other bits and pieces and all this is covered in the Store Coach training programme. 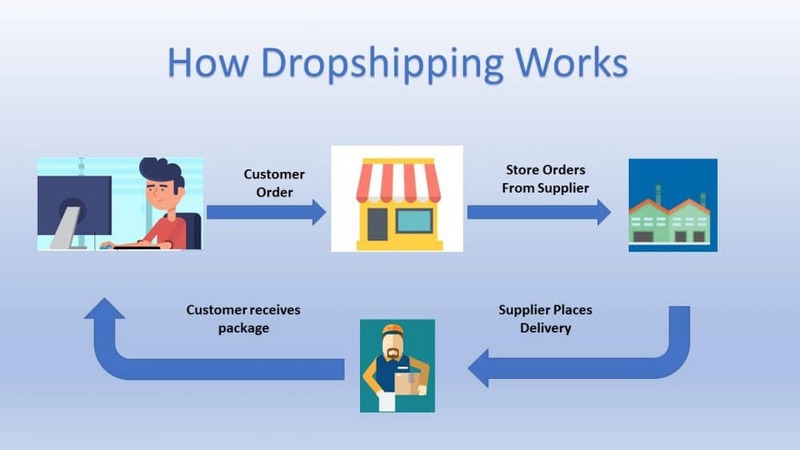 The main attraction of the dropship model is that you keep no inventory and the delivery is fulfilled by your dropshipping supplier. It has a minimum fuss about it and the profit margin is decent, you can expect anything between 15%-25% profit margins. The guys behind this training programme have years of experience in eCommerce and particularly dropshipping. They are experts in their field and haven’t just jumped on the eCommerce bandwagon like so many unethical marketers that promise you quick and easy riches. Choosing a niche – This is probably the most important part of setting up an eCommerce store. Choosing the right product is vital to the success of your online business, fortunately, the coaches have years of experience and know exactly what will be profitable and what will not. There is material on keyword research, awareness of certain niches seasonal vulnerability, how profitable a product is and how easy it will be to rank in Google for that niche. There is material on keyword research, awareness of certain niches seasonal vulnerability, how profitable a product is and how easy it will be to rank in Google for that niche. Business Model – This where you decide what sort of business model you want to set up, store coach are experts in eCommerce so they are familiar with the traditional method of stock and ship as well as dropshipping. They do recommend an affiliate website if the other two options are not viable. Affiliate marketing is what I do and it has the lowest entry point of the three models. The pros and cons of each model are laid out and if you decide with the affiliate model the next chapter is not for you. Sourcing– This is an in-depth chapter, it covers everything from finding a supplier to getting a reseller account with them and what steps to take should they reject you and any other stumbling blocks you may encounter. These guys know their stuff and they go into detail in dealing with potential suppliers, should you open multiple supplier accounts and how to calculate profit margins. Store Structure – This chapter is all about your store design and how to optimise it for best results. It goes into detail about how to structure categories and why having quality content is necessary even for eCommerce stores. This chapter also talks about issues that may arise during the checkout process and the best ways to resolves these issues. Optimising for Google – This part of the training is all about getting you familiarised with SEO and how to optimise your main pages so that it gets indexed and ranked on the first page of Google. Search engine traffic is the most targeted traffic so developing the skills to help you do this will result in free targeted traffic and revenue for your store. Marketing – This chapter is mainly about planning your marketing strategy for the next few months. It introduces you to three main methods of traffic generation, paid, organic and direct. They will also provide a timeline of when you should start seeing some sales come in. Paid Advertising– This is an in-depth introduction into the world of PPC (pay per click) advertising. It touches mostly on Google AdWords and reveals 4 metrics to see if a PPC campaign is worth pursuing. It also touches upon banner ads and how to set up your own affiliate programme. Direct traffic – Here they teach you about simple methods that can increase your traffic flow. It’s mostly to do with posting on relevant forums, engaging with the members and then adding a link to your profile. There is also material on guest posting and how to use Q&A sites to get more traffic. Maximising profits– This chapter covers how to increase your conversion rates and your profits per order. They also reveal their own profit formula and how increasing each factor in the formula will result in more profits. You will also learn about a variety of conversion rate killers and how to avoid them. Topics also covered are A/B testing and if you should expand your range of products. Day to day store operations – The coaches reveal their day to day methods in running an efficient eCommerce store. This chapter is all about effective time management and the reasons to set aside time slots for different store operations. It also goes into detail about outsourcing many of the tasks many of which store coach provides services for. You are also provided information about preventing identity theft and fraud and how this will increase customer confidence. Selling your store – If your store is consistently making monthly profits, you may consider selling it. A typically profitable store goes for more than 18-36× its monthly net income, store coach instructors have years of experience in selling their own and other peoples store for good returns. The chapter reveals the factor that decides if your website will be attractive for potential buyers and places where you can list your site for sale. They also run their own website brokering service that they say will get a far better deal for their clients. Video Walkthrough – dealing with potential suppliers and how to proceed if they reject your application. They even have video role-playing for this so you have an idea on what to say and any pitfalls that may occur during a conversation. Coaching Call – 30-minute call with one of the store coach instructors, I got my call from their in-house SEO expert someone called coach Scott. I had a good conversation with him and the call actually lasted for 1 hour which I was pleasantly surprised by. PDF Guide For Non-US Residents – comprehensive PDF file that guides you in opening up a business entity in the US. This is to show suppliers you are serious and certain suppliers may not deal with companies if they don’t have a US business address. You will get ongoing support, bonus guides, free future updates to any additional training and for 2019, you will get to see them build a store from scratch and get to see how they implement their own training. There are a few things that Store Coach has discontinued from their training program. One is their keyword research tool which was called Niche Finder Pro and the other is their SEO service. This did this because, as they also run their own eCommerce business, maintaining these other services was running them thin and they couldn’t give enough time to their students. So, cutting these services gives them more time to focus on their own business and the Niche BluePrint training program. The membership used to be $49 pm, but now it is a one-time fee of $997, you can either pay this in full or split it up into 12 monthly payments. I wouldn’t normally recommend such an expensive program, however, the developers of this program have over a decade of experience in eCommerce and they have helped hundreds of people start their own successful eCommerce business. They know what they are teaching and haven’t just jumped on the eCommerce gravy train. If you are interested in starting an eCommerce business and have the budget, then it is worth considering taking up this training program. The people behind Store Coach are respected in the eCommerce world, not only do they provide training on how to start an eCommerce business but they also run their own successful stores. Between the three brothers, they have run over 150 stores profitable stores many of which they have sold for a six-figure sum. They know how to run eCommerce stores and although I never promote anything that charges such a high fee, I make an exception for this training program just because of their reputation. NextWebcopycat Review- Easiest System Ever? Tecademics Review – Is it a Scam ? This same to be a very helpful program that can make life so much easier for those who are trying to obtain success. The training however seems to be intense but the end results is that you wold be equipped with the tools that you need to have success online. Thank you! Your review provided an excellent insight into StoreCoach. I have been looking for a company that would streamline the ecommerce process and StoreCoach seems to do just that. I really found it interesting to read. You offer so much detail! I am sorry to hear that your first E-commerce website was a failure. If I want to start a business on an e-commerce website, how much money should I consider to invest in ads in your opinion? I really can’t answer that, it really depends on what platform you choose to advertise on. Most people choose Facebook and I have heard people say you should start small and then scale. $5-$10 a day is what many FB ADS experts say you should start with. The reason why I like storecoach, they teach you both SEO and paid advertising. So if you are reluctant to spend money on ads, SEO is a long term solution but when done right, you get a boatload of traffic on auto pilot. Such a nice review! Simple yet so instructive! I really liked how you went into such details and also explained the benefits of going pro. The programs seems a bit hardworking, but then again everything worth building requires hard work and determination, plus once we see the results, it makes it every bit of it worthwhile. I think I will definitely try this program in a near future, and it is nice to be able to try it for free! Yo man I’ve actually been eye-ing StoreCoach for quite a while now. I’m aware of the free membership but I haven’t gotten to it yet. I’ve heard that a lot of drop shipping sites use Shopify, does StoreCoach somehow integrate with that platform or do they use something else for the website? From your review I can tell StoreCoach does offer some good stuff, and I believe anyone learning from them will be able to find success. Thanks a lot ! Shopify is one of StoreCoaches recommended eCommerce platforms, but they prefer working with 3dcart and bigcommerce. If you subscribe to any of these shopping carts through storecoach, you get a free 2-week trial, although, with 3dcart you get 1 month free. Awesome review, i also have my own online businesses and i definitely want to add eCommerce to my collection, i will try it with store coach, it sounds honest and definitely high quality material plus that they have a free membership is great! Thank you for your review of store coach. As a new affiliate marketer, I don’t feel quite ready to jump into eCommerce but was impressed that there is a free and competitively priced upgrade to train me. I don’t doubt that I will ultimately include eCommerce on my website. I will remember store coach when I am ready and desirous for the training. Thanks for your comment, you have the right attitude, concentrate on affiliate marketing and once you have established yourself and income is consistent, look at other income streams. I have been looking for a good review that tells everything about Storecoach. Looking for making money only and find success in e-commerce. I am a starter and would like to make an e-commerce site. My budget is limited so what do you think. How much money do you think is enough to start it ? StoreCoach is a really good training programme for those looking to start an ecommerce business. Thank you for introducing me to StoreCoach. I have not heard of StoreCoach before and this is the first time I hear this product. But I am still not clear on what StoreCoach really does. Does it give you tutorials, notes, and help on creating your e-commerce platform, or is it a platform to create your e-commerce? Because I am creating an affiliate site and you mention that StoreCoach has material on SEO, I guess I will check it out. Yes, Store Coach does provide tutorials and webinars in how to run a eCommerce store. In their paid membership you have access to more of their tools and extra support which will fast track your progress. In their paid membership they teach PPC and advanced SEO strategies and they have webinars where they teach you to negotiate with suppliers, there is a wealth load of information in the paid membership. They provide other services as well, they will build you a eCommerce store for a very competitive price, they have SEO services in which they guarantee 1-page ranking in Google. I really do endorse this programme because they have been in this industry for a very long time and have been very successful at it. Very interesting program and very interesting review. What I like the most about this program is that they offer Niche Finder Pro Tool for finding golden niches with lots of online demand, but weak competition. Also, as a free member of Store Coach, you can receive invites to periodic webinars put on by their coaches, and there is also a training for building and operating a profitable online store! This is a huge plus, and I will definitely check out this interesting program! Thanks for the review and info, it was really helpful! Glad you found my review helpful, Store Coach is one of the best training programmes for eCommerce, their free membership is really good but their paid has some exceptional material that will definitely fast track your progress. Not only is this a great review for Storecoach, which it is, I also learned some new e-commerce terminology and was introduced to some important parts of online business. I appreciate your detail and depth of the review, particularly breaking down each of the chapters into segments and explaining what a user could expect to learn from this site and their program! Thanks for stopping by and commenting, I’m glad you found it useful. This is a really good review of an interesting product. Like lots of people looking to make money online, I too have gone down the eCommerce route a few times, both on eBay and Amazon. I achieved some moderate success with various items but it was always difficult learning through trial and error, so some detailed training on exactly how to structure an online business could have been really useful. Your review of Store Coach seems very detailed. With so many scams out there, your readers really need as much information as possible to make informed decisions. You have made clear the program’s philosophy as well as the possible avenues that can lead to success. You certainly sound like an expert in this program! I was into drop shipping a while back and had found little success in it. Perhaps it’s because I didn’t know about this program, the one I used was quite expensive and taught me nothing but the fact that it took sales for me on my website. Storecoach sounds like a very sound and reliable product to use, thank you for this review. I found your site to be very informative and you go into great detail and offer a very in depth explanation of the topics you have chosen to cover.I am very new to affiliate marketing but have bookmarked your site as i feel i can learn a lot from you and trust your opinion.thank you for giving me the opportunity to find and read your site and i wish you every success in all your endevours. All the best,Matt. I am glad you found my site useful, I wish you all the best in your online business. I have thought about Dropshipping but it is difficult to get all the information you need to make it work. Storecoach sounds like a great place to start and learn what to need to know. I had a quick look at the free membership but it was very limited and I am not sure if it would be right for a complete beginner. Also, I notice it does not have the Niche Finder Pro. Would you recommend starting with the free course and is there enough in it for a newbie like me? Thanks for stopping by and commenting, I do think there is enough in the free membership to get anyone started but you do get more help and extra tools with the paid membership. Niche Finder Pro is only available with the paid membership, if you want to learn about ecommerce I would definitely say Store Coach is good for beginners and experienced people alike. I can see Store Coach offers, quite simply, brilliant training. If I had found you about six weeks ago I probably would be signing up now, that’s how much I like it. I experience in the past but at the moment I am heavily investing time, money and energy into building my website. Once I get a foot hold on my own affiliate marketing career online Store Coach is going to be something I will be having another peep at. Wow, very detailed review, I have always been curious about drop shipping but I never knew where to start. I like how they cover SEO, as well as where to find a supplier. Trying to find suppliers can be tricky, especially when it’s a possibility that it could be a scam. Thank you for taking the time to make this review! Such an instructive review. You go in-depth very well about the Storecoach. I was always concerned about how an eCommerce store could gain traffic. You described it very well. I like to try drop shipping, but I think the affiliate marketing is proper than for me. What do you think about affiliate marketing and drop shipping which one is your preference? I actually like both, if I had known about the idea of dropshipping before I started affiliate marketing I would have definitely started drop shipping. It doesn’t have a high start up cost and I believe you can start to see results much quicker than affiliate marketing. Both are good business models. If you are a newbie you need the right training and I believe that store coach provides the best training to start an eCommerce business. Hi, I didn’t know much about Store Coach until reading your review. Can I ask what is your preferred method of making money online – affiliate marketing or drop shipping? I’ve never gone down the drop shipping route as it feels like more work for smaller payoff. What are your thoughts on that? Thanks for your Store Coach review. Honestly,if I had known about dropshipping before I started a niche affiliate marketing site,I would have gone with dropshipping. Ecommerce was what started me on this journey to build a successful online business,unfortunately my first try was a huge failure and I lost some money. However,that was the traditional method of eCommerce and not dropshipping which I believe I would have had a greater chance at success. I moved onto affiliate marketing because of its low start up costs. I do enjoy it but because I have to churn out quality content on a regular basis,it becomes difficult for me because I am not the fastest of writers. I do hope to start a dropshipping business once my sites start to make good income. Another good review. I’m definately going to check these guys out if you recommend them. I’m going down the affiliate marking route myself but would like to diversify my online money earning and dropshipping sounds like a good avenue to go down. I’ve bookmarked this page to review at a later time. thanks again for your reviews.